We reported on February 11 that Valentino Rossi had sampled a Racing Box Maserati, at Misano. The Italian team also had its other MC12 present on February 8-9 at Misano, this the Italian GT Championship car for former FIA GT Champion Luca Cappellari and Miguel Ramos. According to the very up to date www.racingbox.it website, Cappellari set a 1:27.9, Ramos a 1:28.3. Rossi set a 1:27.0 in the other car – which is apparently destined for the FIA GT Championship, for Piergiuseppe Perazzini, Stafano Livio and Marco Cioci. The team indicates a 1:26.6 for Cioci (we said a 1:26.7), with a 1:28.4 for Perazzini and a 1:28.3 for Livio. 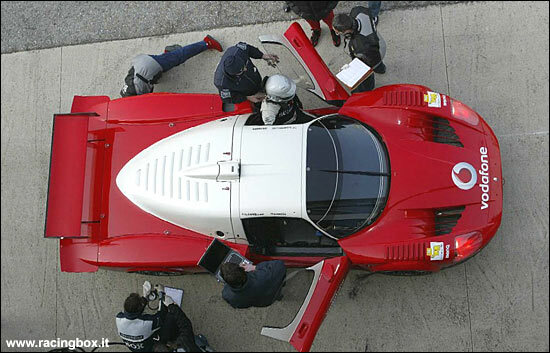 Cappellari and Ramos were driving an MC12 in this livery.